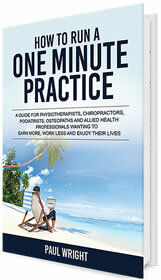 To add the “How to Run a One Minute Practice” book for ONLY $19.95 AUD click on the Book button to the right. I just want the book ONLY and do not need to know how to develop a dream team at my practice or how to make this year my best ever. Get the hard copy book “How to Run a One Minute Practice” for ONLY $19.95 PLUS GET TWO Bonus DVD’s from Paul’s business building range including - Developing Your Dream Team – Hiring, Firing and Retaining Health Professionals (valued at $125) and Business Success Principles for Health Professionals – How to Make This Year Your Best Ever (valued at $125) – for ONLY $99 extra (Save OVER $150). These DVD’s are currently available on our website for $125 PLUS P and H EACH – however - with the “Special Book and DVD International Bundle Offer – you get the BOOK PLUS the TWO Bonus DVD’s for ONLY AUS $118.95 including all P & H for all THREE incredible resources. The 3 health business breakthroughs – are you using them? 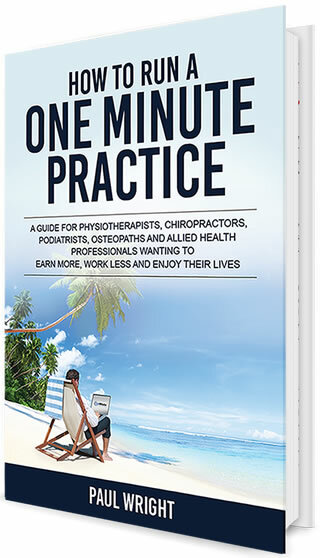 To order the “How to Run a One Minute Practice” physical book PLUS the 2 BONUS DVD’s Valued at $250 AUD “Developing Your Dream Team” PLUS “Business Success Principles for Health Professionals “ for ONLY $118.95 AUD click on the bundle button up to the right. YES - I want the book AND the 2 Bonus DVD’s so can understand how to build my dream team and to make this year my best ever.